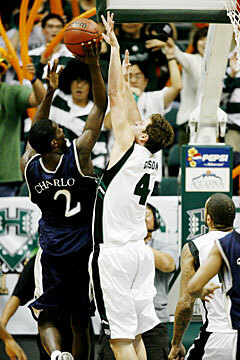 Julian Sensley of Hawaii drove to the basket against Mo Charlo of Nevada last night. Sensley scored 19 points. Nick Fazekas showed why he's considered the top player in the Western Athletic Conference last night. But the Nevada forward's career night wasn't enough to knock Hawaii off its perch atop the conference standings. The Rainbow Warriors weathered Fazekas' 37-point barrage to pull out a thrilling 73-69 overtime victory over the defending WAC champions at the Stan Sheriff Center. "Both teams played really hard and really well," UH coach Riley Wallace said. "It was just one of those WAC battles. "It's a big win because you're sitting up there at 2-0 for another week." The Rainbows (8-4 overall) stayed a step ahead of the pack at 2-0 in the WAC. The victory also snapped UH's three-game losing streak against Nevada (10-3, 0-1). Hawaii was the only home team to win in four WAC games last night. Fazekas dazzled the crowd of 6,331 for much of the game, hitting shots both in the post and from 3-point range. But the Rainbows, who set a school record with 13 blocked shots, corralled the rest of the Pack and limited Fazekas to one field goal in the final 13:57 of regulation and shut him out in overtime. "We went at Fazekas and played him as hard as we can possibly play him," Wallace said. "We ran (four) different guys at him, just trying to make him work hard." Hawaii forward Julian Sensley rebounded from a rough night against Penn last week to lead Hawaii with 19 points. Guard Matt Lojeski added 12 and forward Matthew Gipson had 10 points. The Rainbows also got solid play off the bench from point guard Dominic Waters. The freshman scored nine points in place of Deonte Tatum, who was sidelined with cramps early in the second half. Gipson blocked five shots and forward Ahmet Gueye swatted away four. "Even in the locker room, you could just tell we were going to win this ballgame," Sensley said. "It looked more like how we were preparing for the Michigan State game. Everybody was into it all the way down the bench. "Everybody was making huge plays down at the end. Lojeski caught fire, Ahmet got some huge blocked shots. Dom was knocking down big shots and everybody just fed off that." After going 5-2 on a seven-game homestand, the Rainbows embark on their first WAC road trip of the season next week at Louisiana Tech and New Mexico State. Nevada had a 10-game road winning streak in league play snapped and plays at San Jose State on Saturday. 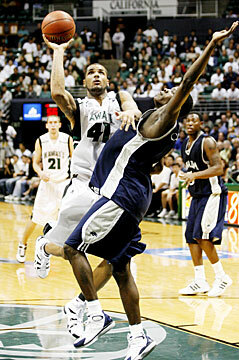 Matt Gipson of Hawaii blocked a shot by Nevada's Mo Charlo last night, one of five blocks by Gipson in the game. "Give them credit -- they made the plays in overtime to win the game," Nevada coach Mark Fox said. Fazekas, the WAC's second-leading scorer, passed his season average in the first half, hitting for 21 points before intermission to send the Wolf Pack into the break with a 34-31 lead. Hawaii jumped out to a nine-point advantage early in the game and led 22-13 before Fazekas took over for Nevada. The 6-foot-11 junior scored 16 of Nevada's next 18 points, capping the run with a 3-pointer from the top of the key to give Nevada a 31-29 lead at the 1:46 mark . "We try to spread it around, but Nick was the only one who could finish a play for us," Fox said. Fazekas was 6-for-11 from the field and made all seven of his free-throw attempts in the first half. "Once I get going I feel like I can just go and no one can get in my way," Fazekas said. "That's the way I felt tonight. I felt like everything was going my way and the rim was putting the ball in for me." UH, meanwhile, relied on balance, with all nine scholarship players getting into the game and eight contributing to the scoring. The Rainbows scored the first six points of the second half to reclaim the lead, but Nevada kept feeding Fazekas, who continued to deliver, putting the Pack ahead 47-46 with a 3-pointer and two free throws. After Sensley knocked down a trey to tie the game at 49 with 11:09 left, the scoring slowed to a crawl. The teams traded blows down the stretch with three ties and three lead changes in the final 6 minutes. UH went ahead on Waters' 3-pointer, but Nevada responded with two Fazekas free throws and a Kyle Shiloh layup to go up 53-52. Marcelus Kemp, who finished with 18 points, made two free throws to knot the score at 58 with 42.9 seconds remaining. After Gueye had an attempt blocked, Kemp's 3-pointer in the final seconds was off the mark, sending the game into overtime. Waters set the tone in overtime by drilling a jumper to beat the shot clock. Two layups by Gipson sandwiched around a Gueye free throw put the Rainbows ahead 65-60 with 1:19 left. UH hit five free throws in the final minute to hold off a 3-point barrage by Nevada as Denis Ikovlev nailed one and Kemp drained two more, the second closing the gap to 70-69 with 10.2 seconds left. Sensley then made one of two free throws and took a charge on the inbounds play to give UH possession with 7 seconds left. Lojeski sealed the game with two more shots from the line. "He was running full speed and he ran right into me," Sensley said. Asked if he would have gotten the call on the road, Sensley replied, "Probably not." 3-point goals -- Nevada 6-16 (Fazekas 3-6, Kemp 2-5, Ikovlev 1-2, Charlo 0-1, Shiloh 0-1, Sessions 0-1), Hawaii 6-17 (Sensley 3-9, Waters 2-3, Lojeski 1-3, Wilder 0-2). Personal fouls -- Nevada 23, Hawaii 21. Fouled out -- Charlo. Steals -- Nevada 7 (Sessions 2, Charlo, Fazekas, Bell, Burleson, Johnson), Hawaii 8 (Sensley 3, Botez 2, Gipson, Lojeski, Thompson. Blocked shots -- Nevada 5 (Fazekas 2, Burleson, Kemp, Johnson), Hawaii 13 (Gipson 5, Gueye 4, Botez 2, Lojeski, Sensley). Turnovers -- Nevada 20 (Charlo 5, Sessions 4, Fazekas 3, Kemp 3, Johnson 2, Bell 2, Shiloh), Hawaii 16 (Gipson 3, Sensley 3, Tatum 3, Gueye 2, Botez 2, Lojeski, Waters, Thompson). Officials -- Dickson, Christman, Hernandez. A -- 6,331. Hawaii guard Dominic Waters lost his way briefly last night - at the outset of overtime, he was headed toward the wrong basket before the tip. But It was a rare misstep for the true freshman, who helped the Rainbow Warriors to a 73-69 victory over Nevada at the Stan Sheriff Center. Waters was the picture of composure for most of the 19 minutes he played, scoring a career-high nine points as starting point guard Deonte Tatum missed almost the entire second half with cramps. Although the Wolf Pack held on to nearly the end of the 5-minute extra period as Marcellus Kemp made two clutch 3-pointers, it was Waters' top of the key trey - which barely beat the 35-second clock - at the outset of OT that held up for the difference. "I had the confidence to shoot and I was waiting for the opportunity," said Waters, who had played in just five of UH's previous 11 games. "You have to have confidence in what you do." Waters also found forward Matthew Gipson under the basket for another score in OT, when every point turned out to be crucial. Coach Riley Wallace pointed out that Waters and classmate Hiram Thompson combined for just two turnovers in a combined 28 minutes. "Both of the freshmen came in and did a good job," Wallace said. "Hiram got three fouls, probably because of their quickness. "(Waters) made some passes to the post and got some backdoors. Dominic and Lojeski both made good passes and we got the ball where we wanted it for a change." Nevada coach Mark Fox said he was not surprised by Waters. "We scouted him and knew he can play. He made big plays, " Fox said. UH forward Julian Sensley said Waters' confidence was contagious in the close game. "Dominic hit some huge shots for us and everybody fed off that," he said. Waters played 14 minutes against Northwestern State on Dec. 23, but then just 4 against North Carolina A&T on Dec. 27. He did not play at all in the Rainbows' loss against Penn last week. "I did wonder about that, but that's kind of how it is now, up and down," Waters said of his playing time. "For coach Wallace, you gotta perform, in games and practice. He'll go with who's playing well at the time. It might be me one night, Hiram another and John (Wilder) another. It works for us. As a freshman, you have to learn to deal with that, and be mentally tough." Waters is a graduate of Grant High School in Portland, Ore. - the same school that produced former UH basketball player and current TV analyst Artie Wilson, and Wilson's good friend, UH football coach June Jones. Both were also basketball standouts at Grant, where waters averaged 23.4 points per game last year. "I met neither one before I came to school here, but I'd heard a lot about both, especially Artie and his ability," Waters said. "Coach Jones, I still haven't met him yet, I'm looking forward to that."